First of all, in my update yesterday I mentioned my rearranging of my office and thought I would show it off! I love reorganizing/rearranging things. Feels fresh. 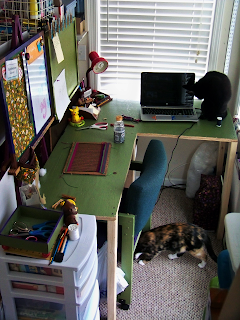 The kitties were excited to re-explore my office. So I'm trying something new today here on the blog. A book review! A few days ago a package I had been waiting almost 2 weeks for arrived. But that is not as far back as this story goes. I was looking for a new book to read all the way back in July and found Born Weird by Andrew Kaufman on Goodreads.com. I read the summary, liked the premise and went searching for it immediately. Libraries? Nope. Local Bookstores? Nope. Amazon, surely Amazon wouldn't fail me? It had a paperback copy for $20 but Amazon.uk had it available in hardcover $10 but wouldn't ship here. There was not a kindle version. I was devastated. I refused to pay $20 for such a flimsy book though, so I waited. At the beginning of this month I found a used one on Amazon that would ship here from Australia and snatched it up. Hoping that my expectation and building up of this great book in my head wouldn't be let down when it actually got here. It was not. The Weirds have always been a little off, but not one of them ever suspected that they'd been cursed by their grandmother. Now Annie is dying and she has one last task for Angie: gather her far-flung brothers and sisters and assemble them in her grandmother's hospital room so that at the moment of her death, she can lift these blessings-turned-curses. And Angie has just two weeks to do it. 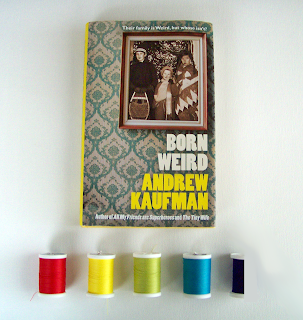 Born Weird's genre is classified as magic realism. The dictionary definition for which is "a literary genre or style associated especially with Latin America that incorporates fantastic or mythical elements into otherwise realistic fiction." Now I have only ever tried to read one other magic realism book, in my senior A.P. Literature class and it left a sour taste in my mouth. It was all the horrible slough my teacher had made it out to be and not the wonderful blend of fantasy and realism the way my mind had imagined. Born Weird is all I thought magical realism should be. If my favorite thing about The Night Circus is the imagery, my favorite thing about Born Weird is the characterization of this crazy, quirky family. You get to read from the point of view of each member of the family, including the mother and father, and the way Kaufman writes you really get to know them throughout the book. Their experiences in flashbacks explaining their behavior/decisions in the present. The motivating factor for the 5 siblings is of course their blessings-turned-curses, nicknamed by Lucy "blursings." That one special power given to them at birth has come to define and control their lives. Richard cannot connect with people and lives his life through a camera lens, Abba lives separated from the present by always hoping for the future, Lucy struggles with a constant striving for order but yearns to truly lose herself (usually in a very promiscuous way), Kent has become so consumed by anger and hatred, and Angie is a human door-mat. Now if we look at these blessings on a larger scale than just which Weird has which, they all seem a little familiar. These are all ideas parents try to instill in their children. I like Kaufman's implication that maybe that's not whats always right for the children and his way of tacitly saying that it's ok to do something dangerous, to lose your way every once in a while, or to be weak sometimes. I would definitely recommend this book to you guys, and hope that you have more luck getting it quickly and easily than I did. I think I am going to read All My Friends Are Superheros by Kaufman next.